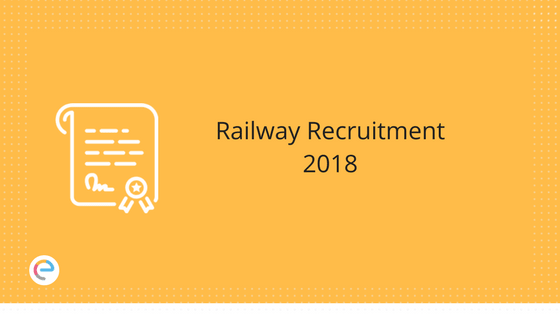 Railway Recruitment 2018 | Good news for Railway aspirants, more vacancies are coming in the Indian Railways. In February, Railway had released a notification regarding the recruitment of candidates for 90,000 posts across all regions. As per the latest update, the organization discharged various opening for Group C and Group D posts. Recently, the Indian Railways announced a 20,000 +hike in vacancies in the department, taking the existing 90,000 vacancies to 1,10,000. Advertisements for the same is assigned to be released by the department in May 2018. For more information regarding Railway Recruitment go through the article below. RRB Group D Railway Group D employees will get level 01 of 7th CPC Pay Matrix with initial pay of ₹18000/- plus other allowances admissible at that time. RRB ALP Level 02 of 7th CPC Pay Matrix with initial pay of Rs 19900/- plus other allowances as admissible. Railway Group D Exam Pattern is given below. Note: There is negative marking for each incorrect answer. 1/3 of the marks allotted for each question shall be deducted for the wrong answer. The questions will be of objective type with multiple choices. Railway ALP Exam Pattern is given below. In order to make their RRB Exam Preparation more organized and disciplines, candidates should prepare a time-table. Once you understand ‘What to prepare?’ it’s your turn to plan ‘How to prepare?’ Make a time-table with both short-term and long-term goals that would help you in timely RRB Group D & RRB ALP Preparation for the exam. Set realistic goals that you can achieve. Block your study hours during those times of the day when you think you are the most productive & can concentrate better and block more time for the more difficult subject. 2. Focus on Concepts Aspirants should focus on concepts rather than adopting rote learning technique. Focus on understanding the concepts throughout your RRB Group D & RRB ALP preparation. Understanding helps you to remember the concepts for a very long period of time. Moreover, with a clear understanding of the concepts, you can comfortably handle questions related to those concepts. 3. Self- Assessment Aspirants must evaluate themselves time-to-time for effective RRB Group D & RRB ALP preparation. Evaluate and analyze your answer sheet well. Quickly scan through the questions for which you gave incorrect answers or couldn’t answer. Do not forget to revise those topics quickly. Check your speed and accuracy while writing sample papers. Sample papers help you to gain confidence and also help you to get used to writing exams. It also helps you to come up with your own strategy of attempting the questions. Avoid guesswork if there is negative marking in the competitive exam you are preparing for. 4. Practice Previous Year Question Papers Aspirants must prepare previous year question papers to know the exam pattern, difficulty level, topic-wise distribution of questions, marking scheme etc. Solving previous year question papers will build confidence in candidates and increase their question-solving skills. Mock Tests plays an important role in RRB Group D & RRB ALP preparation. Candidates should attempt mock tests after completing the syllabus as it will fine-tune their strategy and sharpen time management skills. If possible try to give an online mock test, it takes you proper feel of exam & you can Manage your time for solving the questions. ‘Belief’ is a very powerful tool. You must believe in yourself and your RRB Group D & RRB ALP preparation. Spend 10-15 minutes before going off to sleep to quickly recap all that you learned throughout the day. A bit of physical activity and meditation helps to improve concentration. Do not take stress throughout the entire RRB Group D & RRB ALP preparation time, in fact, stay away from stressful people. Each and every moment you must tell yourself ” I Can, I Will” and trust me you will do it! We hope this detailed article on Railway Recruitment helps you in your preparation. If you have any query regarding Railway Recruitment, drop a comment below and we will get back to you.